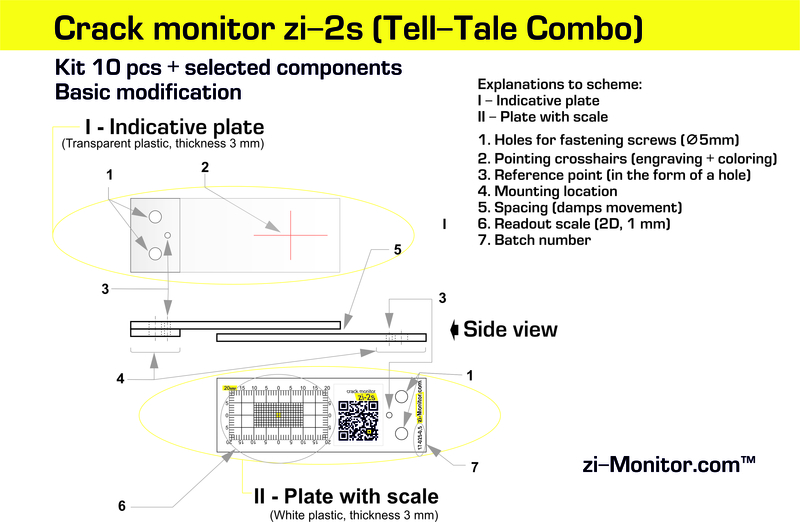 Crack monitor zi-2s is developed in some modifications with supplements and tools. Construction of this model fits into specific requirements of a buyer. A buyer determines, how a crack monitor will look and what options are included in ordered tools. To make an order you should choose one of eight modifications, and then point necessary additional options. The order is preparing for delivery to the buyer very fast – during 1-3 days, depending on quantity of ordered monitors and chosen options. Branding – placing of logo and information about buyer (phone number, site and so on) on the gauge scale. Branding is made with weatherproof polymer sticker. Clamp is applied for fastening of crack monitor plates in zero position for the period of mounting. Marking gauge-ruler – used as comparator for measuring of crack width and for marking of holes for dowels to fasten crack monitor. Mounting plates are fastened to crack monitor plates for adjusting of mounting height on uneven surfaces in the site of fastening to constructions under observation. Adjusting plate is used for provision of split between scale and transparent crack monitor plate. The split allows to compensate possible deformations (movements) of observed construction from the mounting monitor surface, that provides its integrity (not damageability) and possibility of long-term observations. Angle element is used for mounting of crack monitor on the corners of constructions. It is fastened to one of plates of crack monitor with clue. Reference screws are used as reference points for exact observations with electronic caliper gauge. They may be screwed into crack monitor or in adjusting plates. Hex key is used for screwing of reference screws.